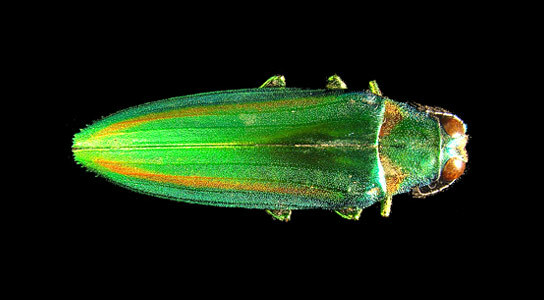 By using elevated pressures and temperatures to simulate the effects of burial on structurally colored cuticles of modern beetles, researchers at Yale University show how colors change during fossilization. An international research team led by Yale University scientists has for the first time explained the preservation of colors in fossil insects. The discovery shows why colors change during fossilization and reveals hidden gems among insect fossils that could help reconstruct the evolution of colors in these creatures. “This information will help us work out what colors ancient insects were and what they used the colors for,” said principal investigator Maria E. McNamara. Co-authored with Yale paleontologist and Peabody Museum Director Derek E.G. Briggs and others, the paper appears online in the journal Geology. Many modern insects owe their brilliant colors to microscopic light-reflecting structures in their cuticles, but the fossil record of these “structural colors” is patchy. Even where colors are preserved in fossil insects, they are not the original colors, which are altered during the fossilization process. Using a novel experimental technique, McNamara’s interdisciplinary team simulated high pressures and temperatures in the laboratory, equivalent to those found in rocks that have been deeply buried over time. The modern beetles that the team used changed color during the experiments, due to alterations to the chemistry and physical architecture of the color-producing structures in their cuticles. McNamara conducted the research during a postdoctoral fellowship at Yale. She is now a postdoctoral fellow at Bristol University in the United Kingdom. The paper, which includes a full list of co-authors, was published on line on Feb. 20 and will appear in the April print issue of Geology. The research was supported by a Marie Curie International Mobility Fellowship through University College Dublin, and by the National Science Foundation. Be the first to comment on "The Preservation of Colors in Fossil Insects"